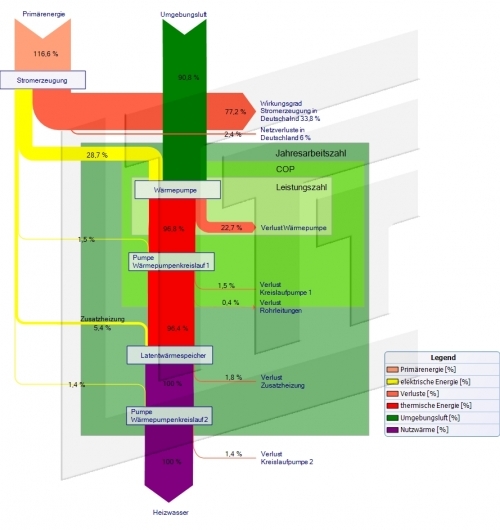 This Sankey diagram is from a research project at Bayreuth University (Germany) on latent thermal storage and heat pumps. Read the project summary here (in German). Flows show percentage shares, not absolute values. LTTT watermark in the background is from the insitute where the project was run. A 2002 Integrated Pollution Prevention and Control (IPPC) report on energy efficiency by UK’s Environment Agency features the following Sankey diagram on page 10. It shows energy flows in a paper mill. Unfortuntately no values are given nor a unit. 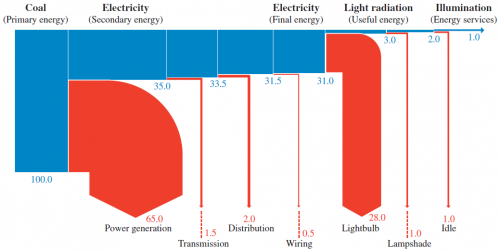 So this is to be considered merely as a schematic diagram, not necessarily based on real energy data. 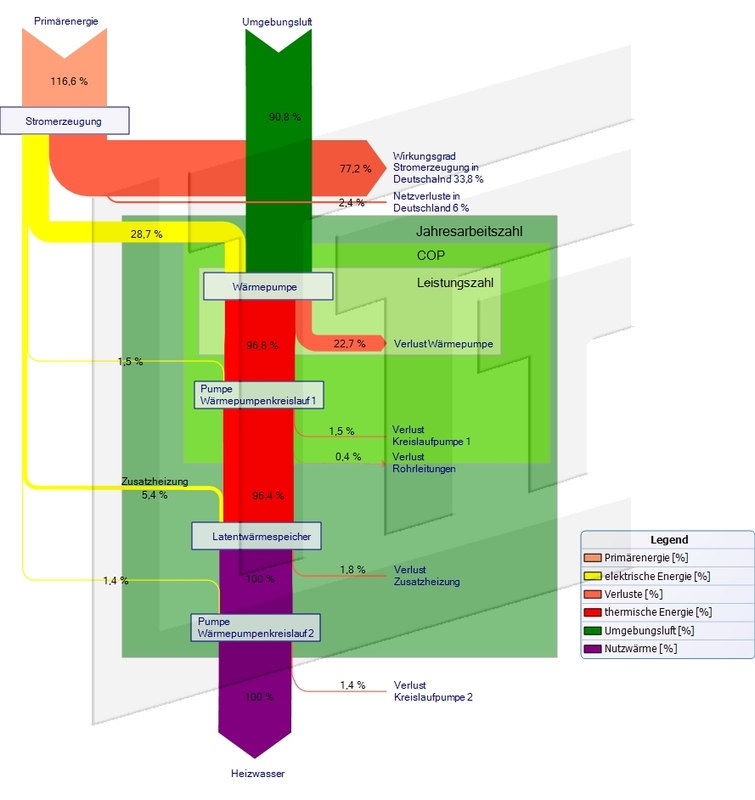 The following Sankey diagrams are from a report published in 2005 by Austrian Environment Protectionn Agency (UBA). The report is on energy efficient technologies and measures to increase efficiency and features practical examples from industry. 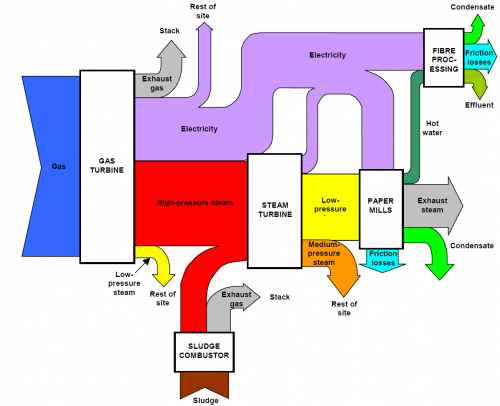 Both Sankey diagrams are from the section on cogeneration (chapter 5, p. 105 and p. 106). The first one shows how natural gas is being used to create 118 GWh electricity and 423.5 GWh steam with an efficiency of 90%. The second diagram is the breakdown of fuels used in another industrial cogeneration plant. It only features percentage values. Both sets of data could also be displayed in pie charts, but the Sankey diagrams with directed arrows make an allusion to the output from gas, and to the input feed (in the second diagram). At the Technical University of Munich a project on Engine Combined Cycle (ECC) Power Plants aims at “improving the electrical efficiency of an engine combined cycle plant by using the exhaust gas heat in a steam cycle”. 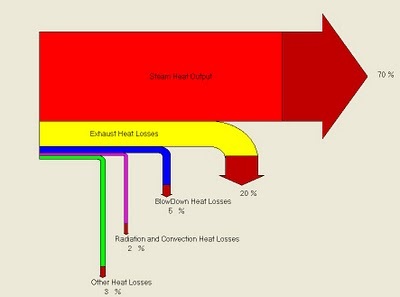 The following Sankey diagram is shown to illustrate where heat can be recovered. 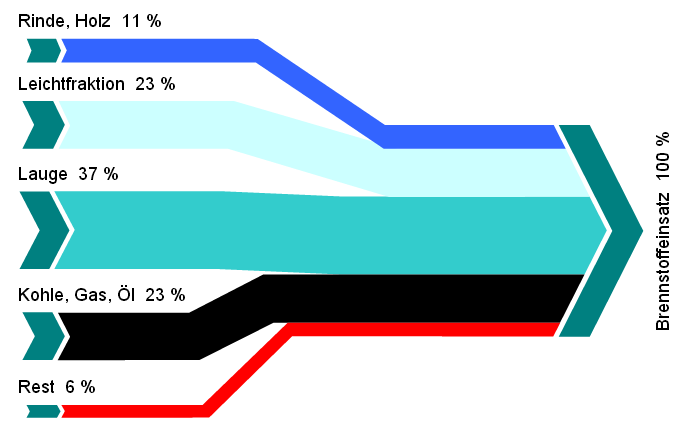 No absolute values are given, but the Sankey arrows represent the percentage of the primary energy. 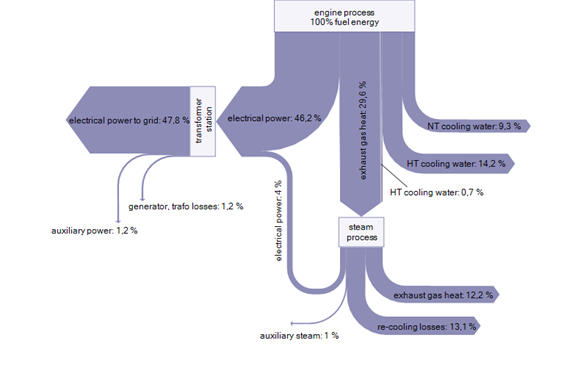 Four percent of the energy in the steam process can be recovered to add a total of 47.8% efficiency output of electrical power to grid. Losses branch out to the right side and are primarily via the cooling water and condensate at the steam process. 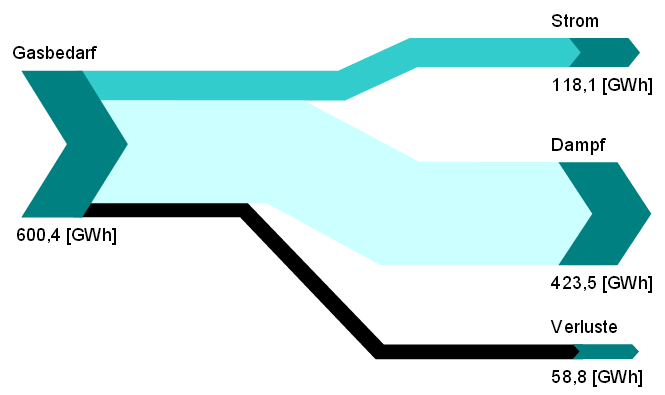 The whole Sankey diagram is presented in a simple single-color design. 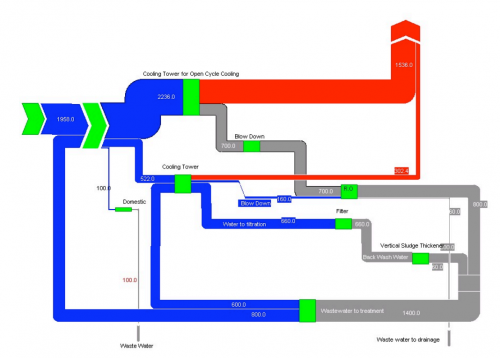 Notes: Boiler Efficiency Sankey Diagram. Uncommon arrow head colouring. Percentage breakdown. 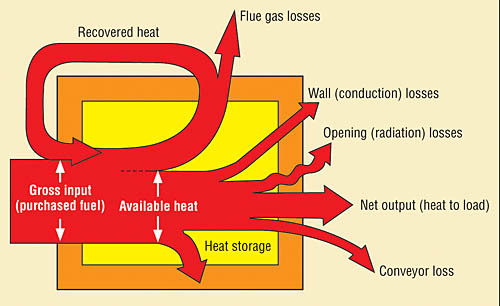 Source: Energy Efficiency Analysis and Practices Blog. This Sankey is apparently produced by a software on boiler efficiency (BIOEFF v1.07), further analysis needed.